Live on-the-go with up to 4th Gen Intel® Core™ processors and experience long battery life and stunning visuals. Add color to personalize and an optional touch screen to boost interactivity. Whether you’re streaming blockbusters or setting a new high score, Intel® Core® processors enhance your experience. Upgrade to 4th Gen Intel® Core™ processors for long battery life and stunning graphics and get the most from your favorite Windows 8 apps and games. 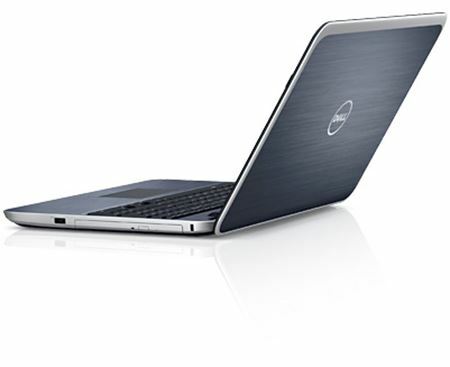 At about 25.4 mm thin, Inspiron 15R slips easily into a travel bag when you need to take your work with you. No wonder it’s our most popular size. Brushed-aluminum finish and rounded — you’ll feel more sophisticated just looking at it. Choose a color that suits your style — silver, or optional blue or red. 39.6 cm (15.6) display: Photos, videos, movies and other images pop on a 1366 x 1378 display in 720p. HDMI™ 1.4 port: Make the Inspiron 15R the power behind your home theater by connecting it to an HDTV or high-definition (HD) monitor. Waves MaxxAudio® 4.0: From Waves Audio, recipient of a 2011 Technical GRAMMY® Award, MaxxAudio® 4.0 gives you total control over your Inspiron 14R’s frequency response. Optical drive: Pop a movie in the tray-load optical drive and enjoy movies on-the-go. Graphics options: Enjoy your entertainment the way it was meant to be seen with faster, smoother videos and game experiences. Choose 4th Gen Intel® Core™ processors for the latest UMA technology. Or, upgrade to discrete graphics with 3rd Gen Intel® Core™ processors. Hard drive: Store your valuable data on a massive hard drive. Ports: Connecting to your peripherals is simple with two USB 3.0, one USB 2.0, HDMI 1.4, and RJ45 Ethernet ports. 8-in-1 media card reader: Enjoy media-format freedom with an 8-in-1 media card reader for outstanding compatibility. Spill-resistant keyboard: Accidents happen. Rest easy and work with confidence thanks to a spill-resistant keyboard. An optional 65WHr 6-cell battery can help you stay powered up long enough to skip the in-flight movie, polish your presentation and drift off to your favorite music.